The rhubarb tart on its own is quite sharp, so the sweetened mascarpone cream helps to balance the dessert. This cream works wonders with any soft fruit. For the roasted rhubarb, preheat the oven to 200C/400F/Gas 6. Cut the rhubarb into 15cm/6in or so lengths (about the length of a wooden spoon-handle) and place in a roasting tin with half a tea-cup of water and the light brown sugar. Roast until just soft enough to take the point of a knife, about 10-15 minutes. Allow to cool, then drain, reserving the cooking juices. For the tart, preheat the oven to 220C/425F/Gas 7. Unroll the puff pastry, and using a rolling pin, roll it again to make the pastry slightly thinner. Cut the pastry into three even-sized rectangles. Using a sharp knife, score a 1.5cm/½in border around each rectangle, being careful not to cut through the pastry. Place the pastry rectangles on a lightly greased baking sheet. 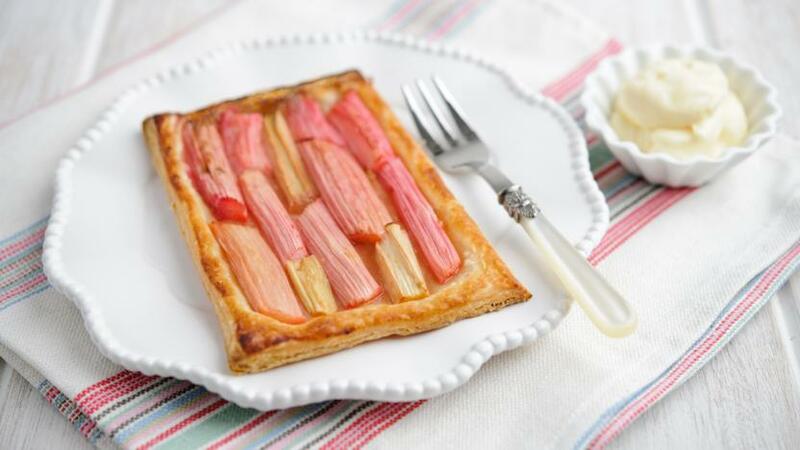 Arrange 3-4 lengths of drained rhubarb, depending on the thickness of them, into the middle of the pastry rectangles and brush some of the reserved juice from the roasted rhubarb around the edges to give the pastry a shine. Bake for 20 minutes, until golden and risen. 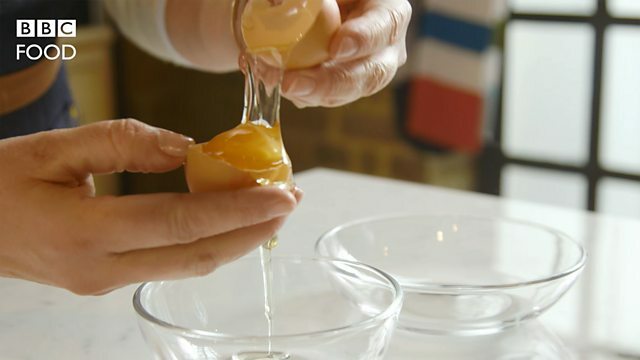 Meanwhile beat the egg yolks and sugar in a bowl for a few seconds, until thoroughly mixed. Beat in the mascarpone until you have a custard-coloured cream. Stir in a little vanilla extract; a couple of drops should be enough. With a clean whisk, beat the egg white in a clean bowl until it stands in stiff peaks, then fold into the creamed mascarpone mixture. Serve the mascarpone cream with the warm rhubarb tarts. Any remaining mascarpone cream can be served the following day with berries or used to top meringues served with fruit.